With this new album, Red Velvet have set themselves as the new cool girls of K-pop. In the Perfect Velvet album, the group takes on the current trends of K-pop with effortless style and all while retaining their unique brand of quirkiness, showing off strong adaptability and a high level of polish. Perfect Velvet introduces us to their new sound of upgraded velvet, adding a blast of energy to the side of Red Velvet associated with slow ballads and R&B. 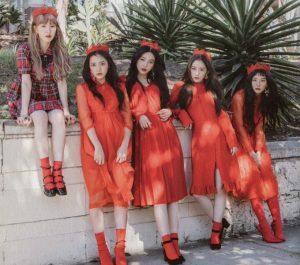 It goes against the set binaries of the two different images created for Red Velvet from the start — velvet and red. The velvet side representing a toned down and classy musical styles while the red side embodies a perky and bold sound. The result is a sophisticated, slick second full album which shows they are sonically the leading girl group this year, and adds to their run of strong albums. Perfect Velvet is the first full album in the mature “velvet” style from Red Velvet and its title referring to their new style does set an incredibly high standard for the group to reach. Previously, the velvet side did appeared rather limited and restrained particularly if compared to the “Red” side which has dominated their music. Before this, Red Velvet had released a string of mini albums in the “red” style, The Red Summer, Rookie and Russian Roulette. So this album marks a long awaited return to the “velvet” side and in this album, they carry over some of the liveliness from the “red” side. Listening through the album, it does certainly feel like the velvet side has been given a new lease of life and the album displays the great ability of the group to tackle a range of genres well. The best example of this would be their lead single, “Peek-A-Boo”, which features a hook filled chorus and cheerleader style chants usually used just in their “red” tracks. It is a deconstructed tropical house song with heavy beats and claps, very different from “One of These Nights” or “Automatic” but also has similarities to both songs. It follows in the vein of the previous “velvet” releases with its haunting, eerie nature and behind the playfulness, there is clear alluring seduction. There is though experimentation as the album extends the “velvet” side to include nu-disco sounds from the ’80s in the brilliant “Look” and a future bass dance tune in “I just”. 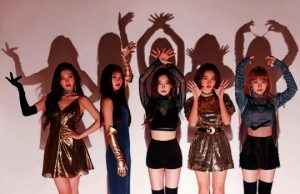 In the case of “Look”, like “Peek-a-boo”, the track is more perky than the usual “velvet” music but with its use of retro synths and deep bass, it is in line with the sultry, mature nature of Red Velvet’s idea of “velvet” music. The introduction of these new styles set free the “velvet” side from its previous supposed limits and display its full potiential. Another thing about this album is how well the album works with its concept. Looking back at their previous albums, Red Velvet have come up with a range of different, unusual themes, giving the group their uniqueness. 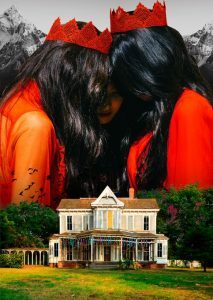 Perfect Velvet is no different with its quirky concept: a close girl gang of mysterious, seemingly supernatural, beautiful and clever serial killers living in a grand house together. In “Peek-A-Boo”, they describe themselves as foxes who want to have fun, reflecting on their sly yet cheeky nature. In many of the songs, Red Velvet turn on the charms. For example, “Perfect 10” oozes sophistication and elegance with its lush, heavenly quality. The standout alt-R&B track has an unreal, dreamy yet inviting air to it with the members singing about becoming a “perfect 10”. In “Attaboy”, Red Velvet appear bold and completely in control stating that they only do what they want, describing themselves as “reckless”, taking on their adopted persona of the cool girls. Furthermore, “I just” is an ominous, stylistic recollection of a breakup with its heavy background instrumentation and with its lyrics where the members are mysteriously vague about the breakup, fitting with their aloof, evasive image. The album emits the style, the mystery, the emotions and the feel of the concept. Did something go wrong while we were roaming the maze? The album is a showcase of the groups’ strengths and clear improvements but also of their weaknesses as well. One of those weaknesses which is very evident on the album is their rapping skills which featured heavily in the tracks, “Attaboy” and “My Second Date”, the two weaker songs on the album. 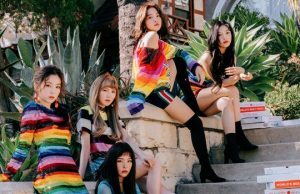 They experiment heavily with a mix of trap beats, hip hop and pop songs and while this displays Red Velvet as a forward-thinking, always pushing the boundaries group, they cover some genres less well than others. In both songs, the rapping comes off as tame with its aeygo-style and does feel very much out of place on the album and with the nature of Red Velvet’s “velvet” side. If I was drawing conclusions from this album, it is clear that their rapping requires more work if they are planning to try more songs in that genre; however, the production on both songs especially “My Second Date” is very skilled. The album does show all members’ vocals at their best and their adaptability to a range of different genres. One of the highlights of the album is the group’s harmonising which is gorgeous and it elevates a great number of songs on the album. In particular, “About Love” is one of the simpler songs on the album, a mid-tempo pop love song. The harmonising in the chorus gives it a jazzy, groovy ambiance to it. Harmonising is also particularly effective in the R&B tracks “Perfect 10” and “Kingdom Come”, providing a heightened sense of tenderness and grandeur. Lyrically, the album while mostly focusing on love does show some wittiness and thoughtfulness. For example, a line in “About Love” saying “When I call your name, it sounds like I’m saying I love you”. There are also interesting, original metaphors used for describing romance. In “Perfect 10”, they sing “every cut is 10, 10, 10” referring to both photo cuts and to romantic moments. In addition to this, there are the vivid lyrics of “Moonlight Melody”, creating an ethereal image of being out at night, looking up at the night sky and trying to listen to the reassuring moonlight melody. Was it the moonlight shining on us? Was it watching over us, wanting to say something? A sound I’ve never heard before. The two of us in that moment. The unforgettable moonlight melody. It is not an overstatement to call this album, one of the best K-pop albums this year, perhaps one of the best k-pop albums in recent years. The album is both polished and experimental, displaying Red Velvet at their best and making them arguably the leading K-pop girl group musically this year. The new brand of “perfect velvet” has truly given the ignored “velvet” side some attention that was much needed and while I would hesitate to call the new style “perfect”, it is near perfect. Perfect Velvet is the type of gem that you can place right in the middle of your pizza.